But there are many areas of overlap. In the example above, when the mites are eliminated, the bird will usually cease feather-picking. However, just like human infants, parrots quickly learn how to get our attention. Let’s suppose the bird in question is housed alone and with minimal human contact. It may very well make an association between feather plucking and attention – when it pulled at its feathers, people came; in some cases, solitary birds may even seek negative attention (i.e. yelling) if none other is provided. Please keep in mind that each situation will vary; if you post details below, I’ll do my best to advise you. Each of the following factors may pre-dispose or lead a parrot to feather plucking; many are examined in greater detail in the articles linked below. Sleep Deprivation: I mention this first because I believe it to be a common but overlooked problem. Most parrots and related birds require approximately 12 hours of sleep in a quiet, dark location. Doing without can affect health and stress levels, and this may translate into feather plucking. Household noises, outdoor sounds, cats at the window, passing cars shining headlights into the room…all can disturb your pets. Boredom: Although commonly cited as a cause for a range of behavioral problems, I’m not sure that most owners are aware of just how active and busy wild parrots are. Even after many years of experience caring for parrots in spacious zoo exhibits, my first observations of wild parrots were eye-openers. Be they Military Macaws in Venezuela or feral Monk Parrots in the Bronx, free-living Psittacines are continually moving, foraging, interacting and vocalizing…and they are rarely if ever out of contact with their mates and/or flock members. It’s impossible for most people to even come close to providing the proper level of stimulation for a pet parrot, and it’s important to realize that captivity cannot undue the effects of evolution. A mate or other companion is often the best option. A serious effort at supplying space, diversions and opportunities for engagement must be a priority: please see these parrot enrichment activities and foraging toys for some ideas. Fear-related Stress: Fears may be a carry-over from earlier times (i.e. among birds that have been abused) or a reaction to changes in the environment. Potentially frightening events include a new household member or pet, extra noise or guests around holidays, the absence of a favored person or a change in the owner’s appearance. Diet: Malnutrition can lead to dry skin, poor feather growth and a depressed immune system. Species-specific diets are now available; please check out these options and post your thoughts below. 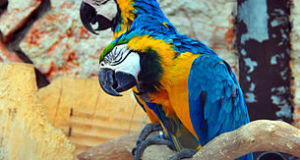 Feather Condition: Ragged feathers (improper clipping, trauma from cage bars) can irritate the skin. Dirty or stained feathers may also be over-groomed; smoke in the home and nicotine on the hands are also serious concerns. Cage Size and Placement: Small cages can cause stress and boredom. 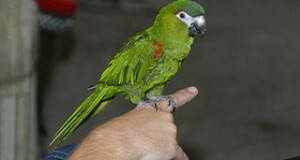 While some parrots revel in being the center of attention, shyer individuals may be frightened if their cage is located in noisy, busy areas of a home. 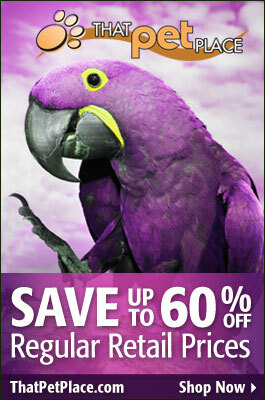 Fortunately, a wide array of cages and aviaries are available; please let me know if you need help in choosing. Parasitic Infection or Illness: Mites and lice are obvious concerns, but non-skin-related problems can also cause plucking. Internal discomfort or injury may very well be involved. Breeding Behavior: Hormonal surges can occur at any time of the year in both seasonal breeders and cockatiels, parakeets and other species that typically reproduce year-round. Frustration can lead to feather plucking in birds kept singly; unwilling mates may also be attacked. At the first sign of feather-plucking, visit a trusted avian veterinarian, so that physical causes may be investigated. Supportive nutrition will likely be recommended. Please post below if you need assistance in locating a veterinarian. Contrary to what you may read, another bird should not be acquired as a companion until the issue is resolved…and then only with care. The presence of another bird, even in a different cage, can be an additional source of stress. The influences mentioned above should also be thoroughly investigated…please post any questions below. Looking for a good avian vet in Michigan, hopefully in the Detroit metro area? Thanks findi, I made an appt with one. I wasn’t satisfied with my last avian vet, these people that I called seem much more informed, All’s they do is exotics.